Sometimes, it’s painful to experience iTunes error and issue, especially the ones that keep you waiting without any form of error notification. “iTunes stuck on extracting software” error is one of the most annoying iTunes errors that keep you looking at the iTunes progress bar with so much hope and expectation that it will start moving again and get to the fullest point, but unfortunately, you ended up wasting your precious time waiting for shadows to move on their own accord. If you’ve waited for hours, days or weeks for iTunes progress bar to complete when it’s stuck on “Extracting Software”, then don’t wait anymore because you are experiencing an annoying iTunes error. So, let’s move forward to how to fix this iTunes error, and how to avoid it from happening again. “iTunes stuck on extracting software” is usually caused by few factors such as Windows Firewall blocking iTunes connection, slow network, outdated iTunes version, or lack of storage space in your iPhone, iPad or iPod touch. Having these reasons in mind, we can now progress to the solutions for fixing the error. The best iTunes error solution – iMyFone TunesFix can easily fix “iTunes stuck on extracting software” without you conducting any research on what caused the error. iTunes users, media/review sites, and tech authorities generally acclaim and praise TunesFix for fixing unknown and known iTunes errors and issues. Therefore, if you’re facing iTunes errors and issues, then employ TunesFix now to take care of this error instantly. 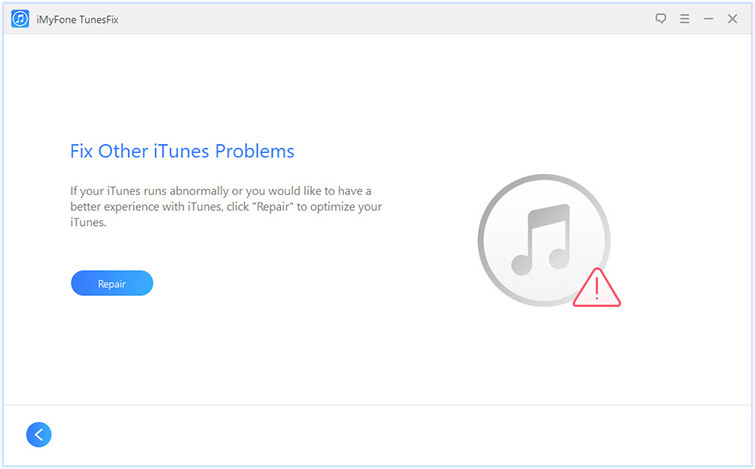 TunesFix can repair iTunes to fix “iTunes stuck on extracting software” issue. Fix over 100 iTunes errors and issues such as install, connect, restore, backup, and other known and unknown errors. Repair iTunes issues and error without distorting your PC operations or erasing iTunes backups. Scan and clear old iTunes backups to free up storage space. Step 1. Install iMyFone TunesFix on your PC/Mac and launch it. Step 2. When it is Launched, it will automatically detect your iTunes and it’s component. If no iTunes issue found, TunesFix will redirect to the Home interface. Step 3. Choose “Fix Other iTunes Problems” and click on “Repair” button. TunesFix will repair your iTunes and fix the issue causing iTunes to stick on “Extracting software” page. The following tips can help to fix “iTunes stuck on extracting software” issue. 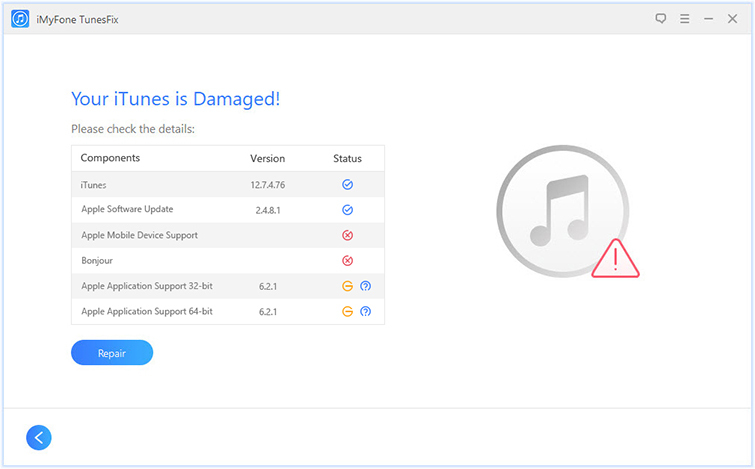 We earlier mentioned that one of the factors or reasons why iTunes is stuck to ‘Extracting Software” page is because Mac/Windows security software might be blocking the connection between iTunes and Apple servers. So, you can solve this issue by turning off the Mac/Windows firewall or quitting other third-party security software from operating in the background. To disable Windows Firewall, go to Control Panel and click “System and Security > Windows Firewall > Turn off Windows Firewall”. To disabled Mac Firewall, go to “System Preferences > Security & Privacy > Firewall”. Then, click the switch to turn it off. Update iTunes on Mac: Launch iTunes and go to “Help > Check for Update”. Update iTunes on Windows PC: Open App Store and click “Updates” to check if there are available updates. If iTunes is not able to update your iOS device, then you can update your iPhone from the Settings app in your device. Step 1. Go to “Settings > General > Software Update”. Step 2. Download and install the iOS firmware by clicking “Install”. Download, install and use an iTunes repairer tool – iMyFone TunesFix in keep iTunes clean and effective. Ensure you always have a strong network connection before embarking on iPhone update. Use iMyFone Umate Pro to clean your iPhone and recover more storage space. Update your Mac/PC before using iTunes.